There are multiple file extractors and compressors available on the market, but for some of the users they are somewhat difficult to handle and include too many options. 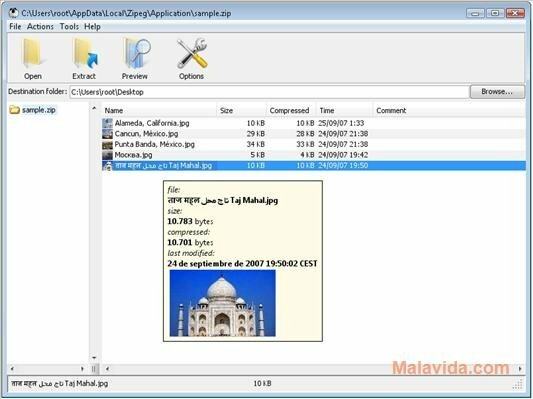 Are you searching for an application that will simply help you to extract the contents from compressed files? Zipeg is the solution. Unlike the vast majority of applications of the market, Zipeg has only been designed to extract the contents from compressed files, specially ZIP and RAR, even though it can also be used with other formats like ARJ, 7z, TAR, ISO, CBT and CBZ. Extracts compressed files with multiple parts. Deciphers ZIP and RAR files protected by means of a password. Quickly shows the EXIF information of images stored within the compressed files. Understands the names of files with strange characters (i.e. names in Russian or Arabic) and it shows them correctly. Extracts and matches the data very quickly. Therefore, if you only need to extract compressed files and you don't have any need for a file compressor, download Zipeg for free. This download requires Java to work properly. This application only extracts files, but doesn't compress them.